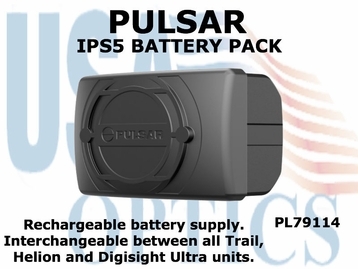 Revolutionizing the way to power thermal and night vision optics, the Pulsar IPS5 interchangeable battery pack provides fast and easily accessible battery life. With an operating time of up to 10 hours this rechargeable battery pack is compatible with all Trail, Helion and Digisight Ultra optics and can be repowered through any three-pronged wall outlet or car charger. The Pulsar IPS5 Battery Pack eliminates the hassle and expense of buying batteries.